We have been growing Brunnera for many years, last year we stumbled across Brunnera macrophylla ‘Sea Heart’ a little by accident, and we love it. A perennial that grows well in shady positions, this really is a great foliage plant. Large heart shaped leaves that make some of the other cultivars look tiny. And texture in the leaves, they are thick with a very distinct pattern. Silver on a mid green is the best description of the colour. The thick foliage makes it a little tougher than others and we use it beneath Japanese Maples. Its is not a tall growing plant, reaching around 20cm in height in our garden, so plant it near a path, or near the edge of the border so you can see the foliage. A mass planting would look great, however we have chosen to grow it in smaller clumps between other shade loving plants. You could grow Brunnera macrophylla ‘Sea Heart’ in a container, as long as it receives adequate shade and moisture. The flowers are blue like many Brunner species, looking a little like forget me nots. You could pick them for a vase, however the foliage is the main attraction. Although this does look similar to B. ‘Jack Frost’. In our opinion the foliage seems thicker and larger. It also copes a little better during our warm summers. It also seems a little more resistant to snails and other pests. Although Brunnera macrophylla ‘Sea Heart’ will grow in tough conditions, as we like the foliage so much we spoil it a little. Fertilise in early spring and again in summer. Over time the plant will form a clump of around 50 cm across. 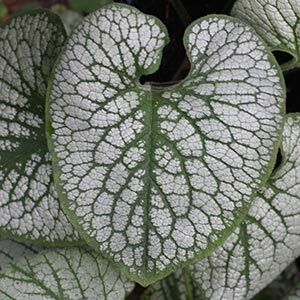 You may need to divide Brunnera macrophylla ‘Sea Heart’ once it gets to this size.